It had been fourteen months since former light heavyweight champion Rashad Evans had competed when he stepped into the Octagon at UFC 133 inside the Wells Fargo Center in Philadelphia on Saturday to rematch former titleholder Tito Ortiz, but you couldn’t tell it by his performance. He did to Ortiz what Ortiz has done to so many throughout his career. Evans let his hands go standing and utilized his wrestling to put his opponent on his back and put him away from there. The two stood and traded shots through the first two minutes of action before Ortiz shot in and secured a takedown. Evans worked his way back to his feet and turned the pressure up with his striking. They had a spirited exchange along the cage where Evans landed several punches, but Ortiz answered with knees. With a minute remaining in the opening round, Evans elevated Ortiz into the air and slammed him to the canvas. From there, he softened Ortiz up with punches and elbows. Evans secured a double-leg takedown early in the second stanza and Ortiz applied a guillotine choke. 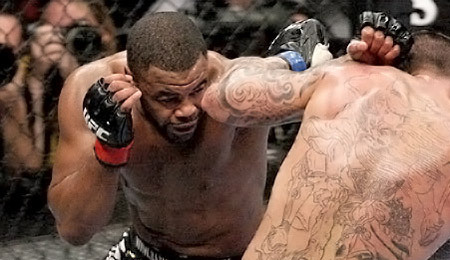 Evans fought his way out of it and began to brutalize Ortiz with ground and pound. Ortiz worked his way up to his knees, but it would be his undoing. Evans delivered a knee to the midsection of Ortiz, causing him to wilt to one side. Evans finished with several right hands, forcing a stop to the fight. “All the hard work, all the trials and tribulations have paid off. In life, you have setbacks; those are the things that test you the most. When you’re in a valley, that’s when you’re tested the most, not when you’re at your peak,” said Evans following the fight. Ortiz made no excuses for the loss and was respectful in defeat. With the Ortiz bout behind him, Evans focused his attention to champion Jon Jones and Quinton Jackson, who fight at UFC 135 in September for Jones’ UFC light heavyweight title. Jeff Cain is a contributing writer for MMAWeekly.com. Follow @JeffMMAWeekly on Twitter or e-mail Jeff a question or comment.